(Reuters) - Trump Entertainment Resorts Inc , which runs two casinos in Atlantic City, filed for bankruptcy protection for a third time, in another blow to the city's crumbling casino industry. Atlantic City's casinos have been losing their glitz and gambling dollars to the more than 40 new rivals that have opened in neighboring states, with gaming revenue nearly halving from its 2006 peak of $5.2 billion. Three of the 12 casinos in the city have closed this year, with one of the Trump Entertainment properties expected to close next week. About 8,300 jobs have been cut so far. Donald Trump sued Trump Entertainment last month to have his name taken off the two casinos, saying the company let the casinos fall into "an utter state of disrepair." The lawsuit reflects the plight of the seaside city, once the only legal gambling market on the U.S. east coast. "The Trump bankruptcy is another step in the never ending spiral for Atlantic City," said David Tawil, president of Maglan Capital, a New-York based hedge fund. "What's most curious is the velocity at which the casino industry has fallen." 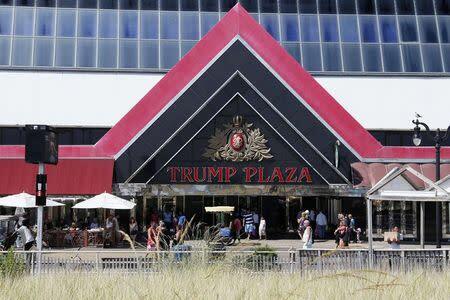 Showboat, a Caesars Entertainment Corp property, and Revel Casino closed recently, while Trump Plaza Hotel and Casino is due to close on Sept. 16. Revel, a $2.4 billion casino, was hailed by New Jersey Governor Chris Christie as a model for reviving the city when it opened in 2012 but filed for bankruptcy twice in two years. Christie, under pressure to revive the fortunes of the faltering city, issued a directive on Monday allowing sports betting in New Jersey's casinos and racetracks. More than 40 casinos have opened in neighboring New York, Pennsylvania, Delaware and Maryland. Trump Taj Mahal Casino, which features 2,000 rooms and domes modeled after India's Taj Mahal monument, may close on or shortly after Nov. 13, if the company fails to reduce expenses and negotiate a deal with its largest union, Trump Entertainment said in its bankruptcy petition in a Delaware court. Tawil said it's unlikely a buyer will come forward for the casino and expects Trump Entertainment to shut down. Trump Entertainment, which had filed for bankruptcy twice before, said it had about 2,800 full-time employees and about 1,800 seasonal employees. Donald Trump's stake in the company was wiped out when the firm filed for bankruptcy in 2009. He emerged from the reorganization the following year with a 10 percent stake and a licensing agreement that allowed the properties to continue to use his name. The company listed assets and liabilities of between $100 million and $500 million and said it owed about $286 million to funds owned by billionaire investor Carl Icahn. Icahn also has a majority stake in Tropicana Entertainment Inc, which owns the Tropicana Casino and Resort in Atlantic City. The case is In re: Trump Entertainment Resorts Inc, U.S. Bankruptcy Court, District of Delaware, No:14-12103.